[0:17] <GreeningGalaxy> I think cmdline.txt just specifies which volume is boot? [0:17] <cnnx> GreeningGalaxy: im trying to use this old p3 500mhz for irssi/tmux instead of buying a rpi, do you think its worth it? [0:19] <GreeningGalaxy> I say if you know how to operate it, do, and in the cases where it's not enough, or you don't know how to work it, buy a Pi instead. [0:22] <mozak> <fsck> sets the order for filesystem checks at boot time; see fsck(8). [0:36] <mozak> wtf is on the end wrtied "Disconnect the power supply from the Pi, remove the SD card, and reconnect the power supply"
[0:36] <mozak> does rpi not need an sd card to point it to boot to hd? [0:40] <Xark> mozak: That is possible. [0:40] <ShorTie> did you burn the usb bit ?? [0:43] <cnnx> our meaning "canada"
[0:51] <mozak> There are many spinning disk drives that don’t respond within the allotted two seconds. It’s possible to extend this timeout to five seconds"
[1:01] <sassinak-work> its is a OTP setting, once it has been set from booting from the SD card it is "permenant"
[1:04] <mozak> do OTP settings write only on power off or can i just reboot? [1:15] <ShorTie> did you get the NEXT version of the firmare ?? [1:28] <AlwaysAwkward> can a pi zero boot from usb? [1:30] <AlwaysAwkward> may I ask what software do you use in the pi? [1:34] <AlwaysAwkward> can you explain a bit? [1:35] <AlwaysAwkward> thing would be to connect pi via usb and boot a live distro from there? [1:43] <mozak> how much power can rpi USB port output? [2:03] <GreeningGalaxy> Speed class 10 is equivalent to UHS class 1. UHS class 2 would be speed class 30, but the latter isn't a thing. [2:05] <cnnx> is it 10megs/sec? [2:05] <GreeningGalaxy> that's write speed. I don't think read speed is appreciably different but I could be wrong. [2:08] <GreeningGalaxy> Pi is a great general-purpose low-power super-reliable computer. Every Pi after the very first revisions of the Model B (B+/A+ through 3B) will probably never be EOL'd, and there's lots of support available. [2:10] <GreeningGalaxy> Zero is included in that interval, if that's what you're about. [2:10] <GreeningGalaxy> oh, what to do with it? [2:10] <phorce1_home> AlwaysAwkward: If you're thinking of the Pi in terms of "carry around and use like a laptop" just sell it to a friend. [2:11] <GreeningGalaxy> I disagree, I think they'll support it as long as Debian does, which will probably be forever. [2:12] <cnnx> so there's lots of add-ons for the pi i see? [2:13] <AlwaysAwkward> is there any way to use the gpio without soldering? [2:15] <cnnx> is it hard to control a gpio pin with C to toggle it on or off? [2:16] <GreeningGalaxy> besides "get a Pi with the pins already soldered on" or "get someone to solder on the pins for you"
[2:16] <GreeningGalaxy> oh yeah, the hammer header! I forgot about that one. [2:19] <GreeningGalaxy> I got someone else's code for direct register access to work in C++ once, but never managed to understand it myself. It was basically a very minimal equivalent to WiringPi I think. [2:29] <cnnx> like a transciever? [2:29] <cnnx> to communicate with another rpi miles away? [2:29] <cnnx> is that possible? [2:34] <mfa298> device to device communications is possible over radio, but tends to be limited to line of site. [2:36] <GreeningGalaxy> why do you want to transmit over long distance to begin with? [2:41] <GreeningGalaxy> fast as you like. [2:44] <cnnx> is it a transceiver laser module? [2:44] <cnnx> that i connect to the GPIO pins? [2:45] <cnnx> would i be reading 0's and 1's tru the laser transmission? and then build my bytes from that to form my characters and packets? [2:48] <cnnx> but i have to align the 2 lasers? [2:48] <cnnx> to form the communication line? [2:48] <GreeningGalaxy> yup. It'll probably work to just widen the focus and aim in the general direction for your first tries, though. [2:48] <cnnx> are these things expensive? [2:49] <GreeningGalaxy> nah, components are almost always cheap. [2:49] <mfa298> you can get low power laser diodes fairly cheaply. [2:49] <cnnx> i can hurt my eyes with these lasers? [2:50] <cnnx> will the red be visible across my backyard in a bright summer day? [2:50] <cnnx> can't i buy a safe laser? [2:51] <GreeningGalaxy> the safest laser is probably a low-power visible red. You can see it and know to blink, and it won't do any lasting damage. [2:52] <cnnx> is it called a laser diod? [2:52] <cnnx> or laser module? [2:53] <cnnx> what wavelenght do i want? [2:54] <cnnx> is that ok? [2:54] <cnnx> for the gpio pins? [2:58] <GreeningGalaxy> I don't know what the law is where you are, but in the US it's dubiously legal to use lasers over 5mW. I think that law really just applies to laser pointer sales specifically, and not hobby applications, but take due warning and don't get in trouble. and DEFINITELY don't risk pointing anything at an airplane. [2:59] <GreeningGalaxy> under 5mW is considered "safe" in that if you catch it in your eye and blink, you won't get any retinal damage. go above that at your own discretion; you may find that you won't be able to find the signal on a bright sunny day. [3:00] <cnnx> and the mA? [3:01] <cnnx> would htat be ok? [3:02] <GreeningGalaxy> uh, anything large with wires attached to it is great. Radial, probably. [3:02] <cnnx> radial 3 lead? [3:06] <GreeningGalaxy> cheap, and they have a collimator you can adjust to refocus them. [3:06] <GreeningGalaxy> what that is is just a cheap laser pointer with wires sticking out the back instead of a compartment for button batteries. Honestly worth a lot less than 6 bucks, but it's Adafruit. [3:06] <cnnx> the software would control the serial? [3:07] <cnnx> its that simple? [3:09] <cnnx> i mean if i type hello in the terminal it will appear on the other terminal tru the laser without any additional hardware other than the laser via the gpio? [3:09] <GreeningGalaxy> That's the idea. [3:10] <cnnx> UART is the communication IC chip on the rpi right? [3:11] <GreeningGalaxy> the current will actually be pretty close to one electron per photon that arrives, although there are a few other factors involved. [3:11] <GreeningGalaxy> Each laser will go to the photodiode at the other end. [3:12] <cnnx> and i guess the higher the watts on these lasers the higher the distance the data can travel? [7:28] <JakeSays> so does it make sense that /proc/cpuinfo shows model as "ARMv7" on a raspi 3? [8:00] <gzuh> any of y'all played around with AlexaPi? [8:11] <[Saint]> incidentally...it /kinda/ can. but you at least need a kernel and ramdisk magic aware of how to unpack an archive. [8:55] <dualcells> Holo: Yes, there have been more than a few example videos I've seen on YouTube. Have you tried typing 'raspberry cluster' into a search engine? [9:09] <[Saint]> Good morning starshine. [9:35] <brainzap> I have the nodemcu with 4MB, but I want to record more data. [9:35] <Habbie> can't network it? [13:28] <BurtyB> HoloIRCUser1, you'd need to split it up and distribute it most likely for each core on each machine you have in your cluster. [13:52] <Dworf> hi! anyone using codesys with raspberry? is there some easy way to autorestart demo every 2h? [13:53] <Doorcellar> I've just setup motion pie with a brand new official raspberry pi camera and it wont see the camera. I cant find much by doing a google search can anyone help? [13:55] <Chocolophophora> what does the colon do ? [13:55] <CuSn> ":" as a logical is "true"
[13:57] <CuSn> it's right in the man page. [14:00] <CuSn> ":" No effect; the command does nothing beyond expanding arguments and performing any specified redirections. A zero exit code is returned. [14:01] <CuSn> so : is a place holder that always returns true: "A zero exit code is returned." [14:28] <deskwizard> 'morning! quick question for you guys... does the HDMI CEC show up in /dev? [14:55] <fred1807> I am trying to install a fresh raspbian lite image on a headless pi. At first was impossible to ssh into it. Now I created a ssh file inside /boot, and still, impossible to login with user:pi pass:raspberry . This /boot/ssh file only works during the first boot of the image? [15:24] <dualcells> fred1807: I think ssh is disabled by default for security because the username/password (pi/raspberry) is published. [15:37] <gordonDrogon> temp. website issues - it'll be back soon. [15:37] <gordonDrogon> it's a free market. people can charge what they think they can get away with. [16:12] <IT_Sean> YuGiOhJCJ: you do know that you are allowed to lie on the internet. Right? 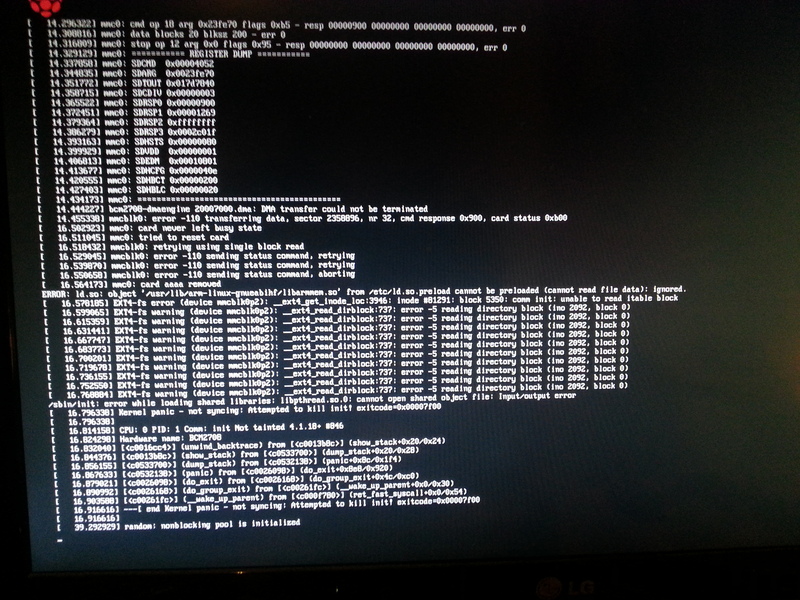 [16:15] <JakeSays> my pi is freezing during boot at "starting file system check on mmcblk0p1" - anyone else seen this? [16:35] <YuGiOhJCJ> it is a "Permission denied" on "/usr/local/lib/python2.7/dist-packages/protobuf-3.2.0-py2.7.egg/EGG-INFO/namespace_packages.txt"
[16:41] <stevie86> OK how do I find the package it belongs to? [16:42] <YuGiOhJCJ> to know that I need to know the disto you are on... Ubuntu? [16:43] <avu> Debian doesn't install anything in /usr/local, don't think Raspbian breaks with that rule. So it's probably something that got installed without apt. [16:43] <YuGiOhJCJ> really you don't remember that you have downloaded protobuf yourself and did a "make install" step? [16:56] <YuGiOhJCJ> it means that you installed you own python-protobuf package or maybe you installed no python-protobuf package at all but you built from source code it then you typed 'make install', it does not remind something you did previously? [17:09] <max12345> what are my options, copy the data from an sd card reader and redo the OS? [17:11] <Conino> max12345, any specific errors being reported? [17:25] <max12345> ok I put the card in, unmount it and "fsck /dev/sdbNUMBER" yes? [17:26] <max12345> "dirty bit is set, remove it?" [17:28] <max12345> ok, that's it? [17:29] <max12345> it only asked to perform changes and then said I have y files and x/x clusters, so I guess it's done? [17:31] <Conino> are you certain it finished the fsck? [17:33] <Conino> if you create a file called "forcefsck" in / and put it back into the pi, what happens? [17:35] <Conino> try a different port? [17:39] <YuGiOhJCJ> and maybe you will get something like: "dpkg-query: no path found matching pattern *namespace_packages.txt*"
[17:39] <YuGiOhJCJ> is it what you get? [17:39] <Tachaway> is fbtft built into the raspbian kernel or as a module or does it still have to be built? [17:44] <chisight> Tachaway: pro hint, questions sent to both channels are usually ignored. [17:49] <chisight> it takes time for someone who knows the topic to happen to show up and read it. [17:50] <chisight> 3 minutes for something obscure usually isn't enough. [17:56] <max12345> I can still just grab the data and redo the OS right? [17:57] <max12345> wouldn't that be simpler? [17:58] <max12345> ... i can upload a photo of the error messages leading up to this? [18:02] <max12345> after turning it off and on again, I get no green but the full ext4-fs errors... sending those instead. [18:04] <JakeSays> so on a pi3 why would this tree be used: device_tree=bcm2709-rpi-2-b.dtb instead of this one: device_tree=bcm2709-rpi-3-b.dtb? [18:06] <RoBo_V> there is nameserver set on my IP and it is being updated. But why I'm not able to ping it or connect ? [18:08] <Conino> are you using a router? [18:09] <JakeSays> how long should a file system check take on a 32gb sd card? [18:09] <RoBo_V> It was working earlier but not from last 2 days. [18:10] <Conino> RoBo_V, ah it was working.... what has changed since? and changes in the router? firewall? [18:11] <RoBo_V> Conino: enabled firewall on pi abut forwarded all ports and stuff. Also if I disable it still not able to ping. [18:11] <RoBo_V> Infact im not able to ping direct ip tooo.. seems strange. [18:13] <Conino> max12345, Kernel panic! [18:14] <Conino> you're better off just saving the data you need and re-imaging the card. [18:18] <pwillard> I had 3 Samsung's that all worked for one boot and then never again. [18:21] <max12345> ok, what's the command for the health check and that probably means I need a replacement yes? [18:23] <Conino> max12345, maybe "F3"
[18:29] <max12345> Conino: thank you very much! [19:01] <JakeSays> what is the initial pi password? [19:03] <leftyfb> you've been using a pi for at least 2 months and didn't know that? [19:21] <EnrgySmth> So... if I am wanting to make an alarm clock out of a Raspberry Pi 3B - and there may not be internet access, do I need to add an RTC? [19:24] <gordonDrogon> if you have intermittent internet access, then NTP will work just fine. [19:25] <gordonDrogon> although you might need something after a power cycle. [19:26] <EnrgySmth> ok thanks all - appreciate the input. Network access will not be guaranteed, so RTC to be safe. [19:35] <shiftplusone> JakeSays: is i2c_dev loaded? [19:36] <gordonDrogon> you don't have the i2c-dev module loaded..
[19:38] <kubast2> How would you wire a 12V 4 pin fan? 12V+[psu]Fan+ 12V-[psu]5V-[pin 6]Fan- PWM0[pin 12]Fan PWM? [19:38] <shiftplusone> but how do you expect your mux to be used? [19:39] <JakeSays> shiftplusone: yeah i for some reason thought i2c was enabled. [19:40] <shiftplusone> it is. there is a distinction between kernel i2c drivers and the i2c_dev interface for userland. [19:40] <ali1234> and it is perfectly reasonable to use a mux entirely from kernel. and device tree overlays are entirely a kernel thing. [19:40] <JakeSays> will raspi-config set that up? [19:41] <JakeSays> heh. there they are. [19:45] <JakeSays> is it possible to drop the pi3 cpus to 900mhz? [19:48] <cub28> ok, so i bought the parts for my raspberrypi, i photoshopped this so you guys can see it. why are there more pins of the board than on the tft display?? [19:49] <cub28> so it's still be a decent frame rate and all? [19:50] <cub28> is thre a small one that has hdmi?? [19:50] <cub28> how about 30?? [19:53] <JakeSays> cub28: eye candy is in the eyes of the beholder. to me that looks pretty fugly. [19:54] <cub28> dont like animation? [19:56] <ShanShen> Hi! Has anybody had to sync a RPi folder to Google Drive? [20:08] <cub28> or if i put the display outside of it? [21:24] <jmp0x2a> is there any difference in hw components of the pi1B(512MB) and the pi zero? [21:28] <ShorTie> did you boot the p1 with the tv on ?? [21:30] <Zardoz> they both should work. [21:31] <Zardoz> waht power supply are you using? [21:31] <ShorTie> but what about your micro-usb cable, does it have 24awg printed on it ?? [22:20] <IT_Sean> thank you, gordonDrogon, for that highly technical answer. [22:20] <ali1234> what is the battery capacity? [23:00] <gsora> do any of the existing raspberries decode h265? [23:41] <louisdk> Is a heatsink really needed for the pi3 if I mainly use it for 1080p playback? [23:49] <HrdwrBoB> I mean ambient temp. [23:51] <louisdk> About 18-20°C. Ventilated daily. [23:56] <gsora> my raspberry zero restarts hdmi connection every 1-2 minutes, anyone has this behaviour?